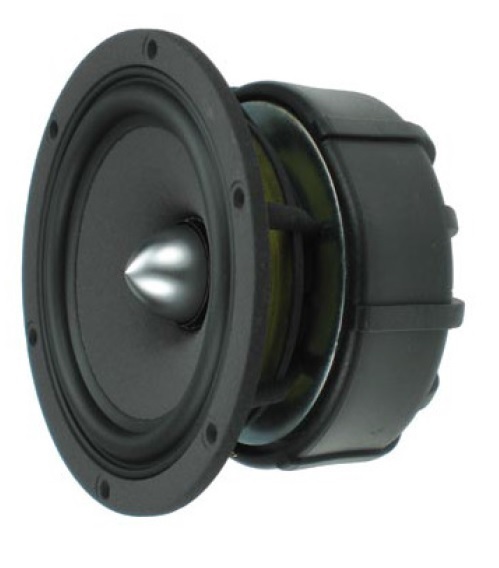 The W12CY003 is a 4.5″ mid-woofer from the Seas Excel series. It uses a paper cone with a Nextel coating, which ensures smooth frequency response and low distortion. Heavy copper rings are mounted above and below the T-shaped pole piece and reduces the non-linear and modulation distortion and increase the overload margin. An extremely stiff and stable injection moulded nextel coated metal basket keeps the critical components in perfect alignment. Large windows in the basket both above and below the spider reduce sound reflexion, air-flow noise and cavity resonance to a minimum. Slightly higher sensitivity and a considerably higher resonance frequency than the official specification. Some sort of resonance issue can be seen around 950Hz. Baffle size (WxH): 19×30,5cm with 12mm round-over on the baffle edges (r=12). Driver position: Mounted on center-line with driver unit center 20,2cm from the top of the baffle. Left: Frequency response on-axis (Blue=sample#1 Red=sample#2). Right: Frequency response 15deg off-axis (Blue=sample#1, Red=sample#2). 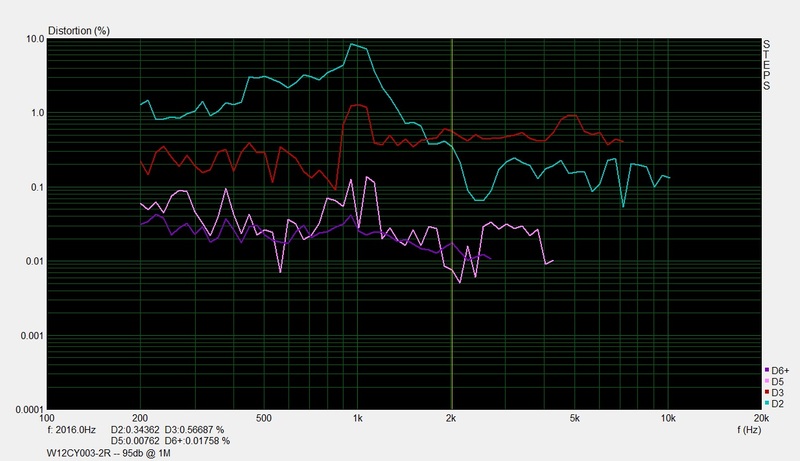 The two mid-woofer samples measures virtually the same. 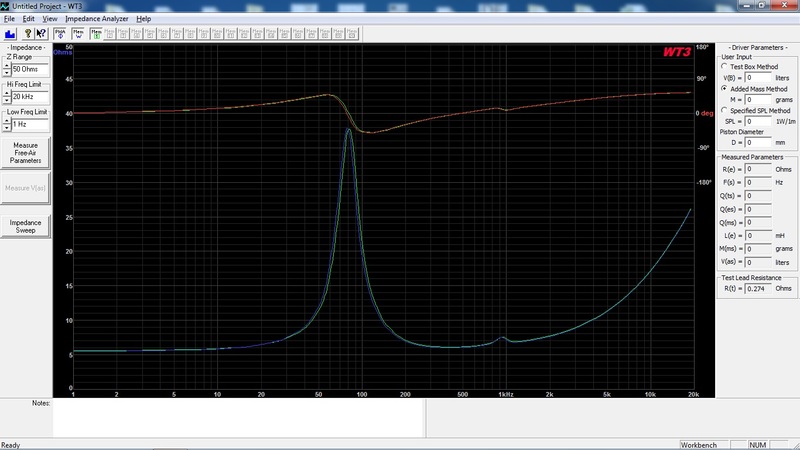 The broad hump between 500 and 1.1kHz is due to the effects of the test enclosure’s baffle step. There is a dip in the frequency response at 1.1KHz, probably due to a cone edge resonance. The mid-woofer starts to roll-off at 3.5kHz and has a very extended and relatively smooth frequency response. The distortion measurements are done in near-field and the amplifier output level was adjusted for each driver so that the fundamental is 85dB, 90dB and 95dB at 1m. This setting simulates medium, medium-high and high listening levels. Overall this is a low distorting mid-woofer. 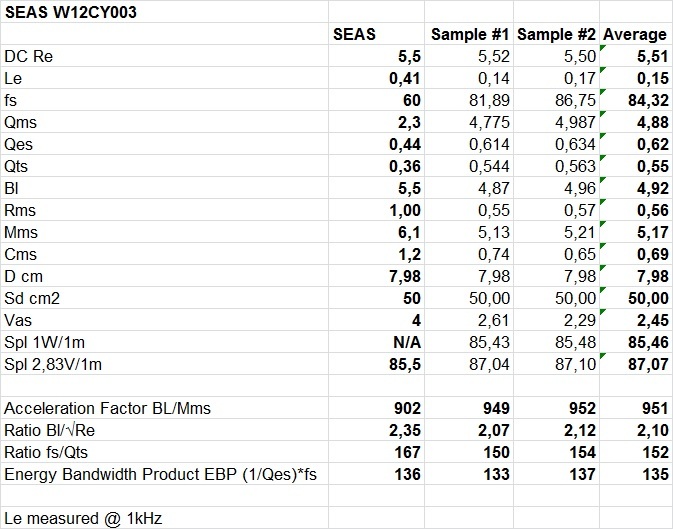 We have an elevated second-order harmonics between 0-4-1.2Hz, which follows the frequency response of the baffle step. There is a narrow banded increase of third-order distortion at higher levels (95dB) around 950Hz that corresponds to the wrinkle in the impedance plot at the same frequency. Otherwise the odd-order distortion profile is low throughout the frequency range up to about 4kHz.